Recently, I’ve been all about the carbs. Just because I’ve been watching my gluten intake doesn’t mean I can’t enjoy a hearty plate of pasta. After perfecting my Best Vegan Gluten-Free Mac ‘n’ Cheese, I wanted to make an equally fast recipe with a slight twist; one that involved vegan cream cheese. Because yum. Who wouldn’t want cream cheese in their pasta? That’s what I wanna know. This recipe is simple, requiring just 30 minutes from start to finish. 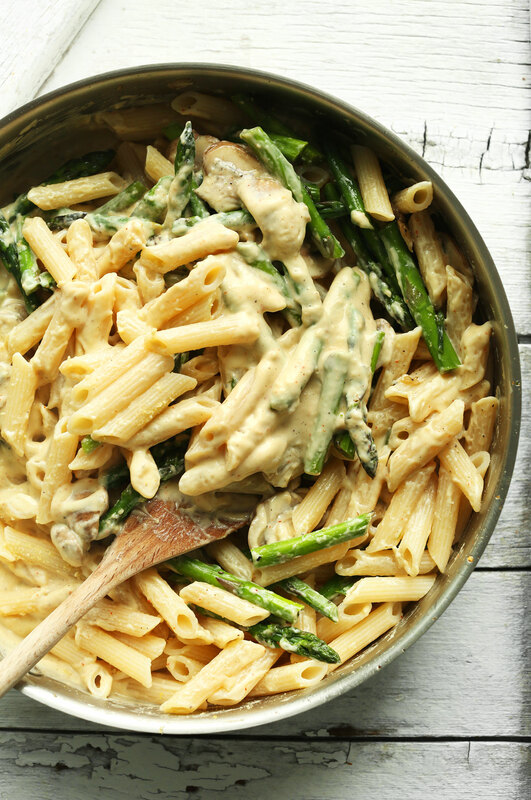 The base ingredients are gluten-free penne (I list my go-to brands below) and asparagus and mushrooms sautéed in garlic. The star of the show, however, is the sauce. This sauce is a simple blend of vegan cream cheese, garlic, almond milk, nutritional yeast, vegan parmesan cheese, lemon juice and red pepper flakes. 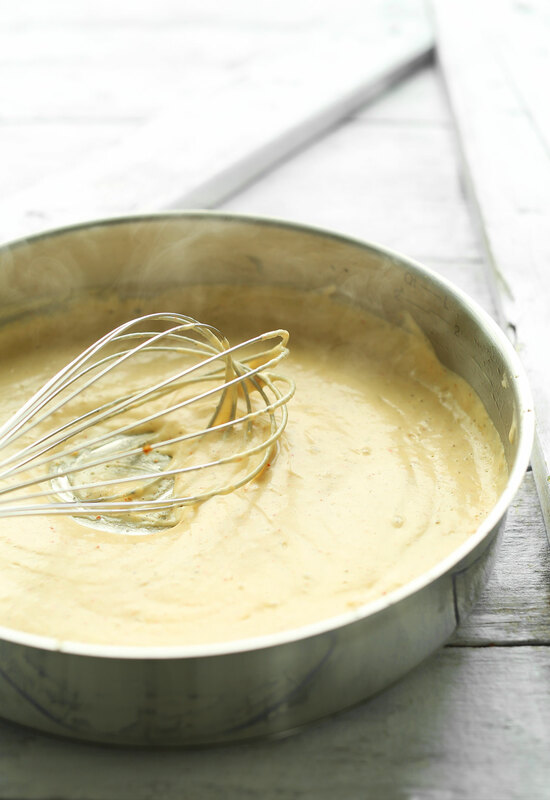 The result is an insanely creamy sauce that comes together in no time and has the perfect balance of “cheesiness” and spice. I think I’m in love. 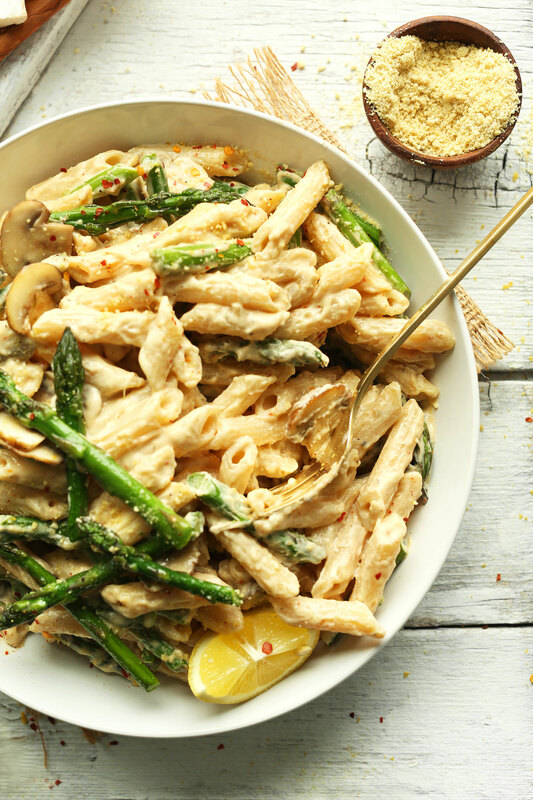 This is the perfect pasta to make for spring, utilizing all the gorgeous green asparagus you can get your hands on. This would also be a great one for feeding a crowd, as it’s undetectably vegan and gluten-free, so everyone can enjoy without missing out on flavor. If you give this recipe a try, let us know what you think! Leave a comment, rate it, and don’t forget to tag a picture #minimalistbaker on Instagram. We’d love to see what you come up with! 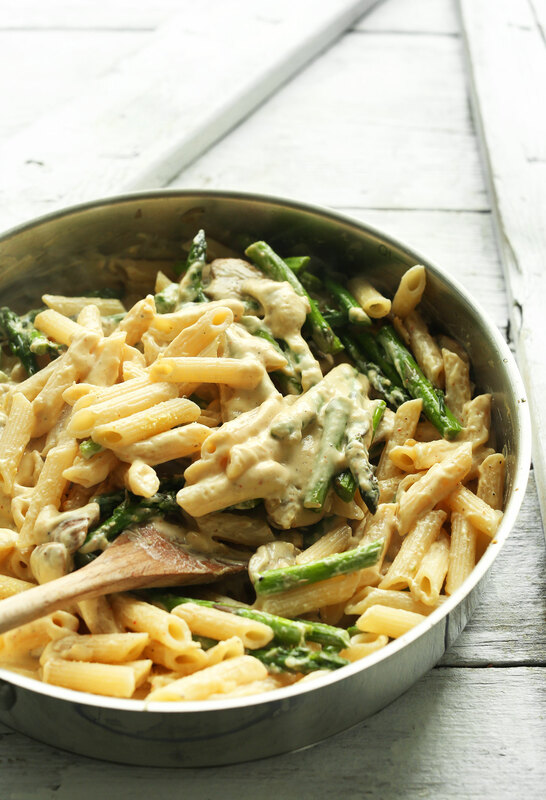 Creamy mushroom and asparagus pasta that's entirely gluten-free and requires just 30 minutes to prepare! A hearty, quick, and flavorful plant-based meal. *My new go-to gluten-free penne is by the brand Bionaturae. But I also love Trader Joe's gluten-free fusilli. *My favorite vegan cream cheeses are by Tofutti and Trader Joe's. But if you can't find vegan cream cheese, you can try subbing 1 cup soaked cashews in its place. However, I haven't tested the recipe this way and can't guarantee the results. For other similar options, check out my Best Vegan Gluten-Free Mac 'n' Cheese. *Nutrition information is a rough estimate calculated without additional vegan parmesan cheese. Modified nothing…..and delicious! I serve it routinely to my vegan and non-vegan guests alike and nothing but raves. Delicious, easy to make, and a quick prep. More stars are needed!! Couldn’t find vegan cream cheese in my area and used regular Parmesan cheese. Both my partner and I are non-vegans…this recipe opened our eyes! Delicious! Hoping to make it next time with the real vegan ingredients. Thank you for doing what you do! This dish was AMAZING!!! It was creamy, cheesy and very easy to make. I just got a little confused with when to put the garlic in. I think I ended up putting way too much garlic, but I like garlic so I didn’t bother me. The asparagus was good too, but I may use broccoli next time for my kids. I added some vegan sausage when I was cooking up the asparagus and it was so good! I definitely would recommend that everyone try this recipe. Thanks for sharing, Veronica! The garlic should be added in step 1. Hope that helps! Hi Inah, we don’t think lime would work. Apple cider vinegar might work, but we haven’t tried it and can’t say for sure! All I can say is YUMMY! EASY! DELICIOUS! Thanks for the tip about your new favorite gluten-free penne. I bought it and I have to agree! Bionaturae penne is my new favorite too! Can I make this without the nutritional yeast and cheese? If not, would mozzarella be ok? Thanks so much. Hi Dana, We think it would work better to sub the vegan cream cheese for soaked & drained cashews (~1/2 cup) and the vegan parmesan for real parmesan. Hope that helps! I made this for dinner one night – so quick and tasty! My parents (non-vegans) actually requested I make it for them as well. They loved it! Make this weekly and works great for non-vegan guests (even my picky mom!). The recipe is indestructible… I’ve used canned garlic, skipped the saute part, skipped the vegan parmesan… it’s still great. Awesome sub for alfredo sauce. Thanks!!! I needed a recipe that used both asparagus and mushrooms because I had both in my fridge and they were going to be bad in a few days and this recipe totally delivered! I’ve been vegan a little over a year now and had yet to find a good cream/alfredo-type sauce that was really good! Most recipes only use cashews and that tends to be too heavy and sometimes gritty for me. This sauce was amazing and I loved the mushrooms and asparagus. As a note, I didn’t have any fresh garlic on hand so I only used garlic powder, a LOT of it, haha, and it turned out great! Though you’ll end up with a different flavor, I think that would actually work, Michelle! I made this today and it was easy to make and very delicious. I love how simple this was to make. Even my picky husband loved it too. Grateful for these wonderful tasty recipes. I subbed the cashews and it came out great! Just added a splash of cashew milk not the whole amount. Also added black lentils for protein. Super yummy. Great! Thanks for sharing, Brooke! Seriously one of my favorite dishes to make! Love this recipe. I always end up adding some extra veggies – this sauce is to die for and versatile! Thank you!! Yay! Thanks for sharing, Nicaela! I made this recipe. It was delicious. My husband does not like mushrooms but he ate it just the way I made it with the mushrooms and he said it was delicious. Definitely one meal I will make again. It was so creamy. Yay to husbands eating mushrooms! :D We’re glad you both enjoyed this dish, Brandy! I make this with oatley cream, nutmeg, vegan Parmesan and plenty of s and p! My take on carbonara! This was soooo good. Thanks for this recipe. Next time, I’m going to try making it with broccoli instead of asparagus. substitute for almond milk? im allergic! This was just as good as it looks – would add more mushrooms & asparagus but OMG tasted better than the traditional. I made this and it was delish! I didn’t have the cream cheese, so I just used the cashew milk. Love the idea for putting the raw garlic just right in the milk when I made it in the Vitamin. This is a real keeper and I can’t believe there is no cream in it feels so decadent. What could I use instead of lemon juice? I’m not a fan of lemon and asparagus together. I have not heard of nutrulional yeast, I looked in the supermarket and couldn’t find. What is it and where would I find it. Thankyou? Hi Lindi! Nutritional yeast is a popular vegan cheese alternative which can be used on many dishes. You can find it here! This recipe was so delicious! I used whole wheat pasta. And I LOVE pasta. First time using vegan cream cheese. Very smooth and creamy. Asparagus and mushrooms together! HEAVEN! So I will definitely be making this again. I might try it with the Cashews since I always have them on hand. And there was just a bit too much garlic for me. I am always looking for recipes that are quick and yummy. I have pinned several of yours on Pintrest. I have been vegan since August ’17 and have cooked 98% of my meals since then. This recipe is by far my top 3 since I have been vegan and my #1 favorite from Minimalist Baker. Thank you for all you do! THIS WAS THE BOMB.COM. Making it again FOR SURE. Try this!!! I didn’t add nutritional yeast, just because I don’t have. I added coriander powder. And I served it with fresh basil, Lovely! Definitely I’m going to do this again. This was delicious and so easy to make. I added a little more nutritional yeast. This may be my favorite Minimalist Baker recipe! It was still great the next day for lunch! I’m thinking this would be good using baby spinach when fresh asparagus is out of season. Add the spinach in Step 1 in place of asparagus and cook until wilted and mushrooms are browned and softened then continue with recipe as written. Made this today and it was DELICIOUS! I didn’t have the parm so I just doubled the nutritional yeast. Next time I’ll add more mushrooms, but it really is perfect just the way it is. This recipe is to DIE for!!! I made it for the first time last night and even my dad who is not a vegan eater went back for seconds! ?? I used parmelas creamy original nut cheese and it is for sure a vegan cream cheese fav and it added some yummy flavors to the pasta. Will for sure be making this a home staple! Thanks for all your rockin recipes. I substituted real cream cheese, milk, parmesean and organic wheat pasta, and it was really good as non vegan as well. I’m looking to also try a non vegan version. Did you sub in the same quantities as listen on the recipe? This is the best vegan pasta I have ever made! I made it with lightly salted cashews instead of cream cheese and oh boy! It was really yum. Thank you for the recipe! Hi Dana! I’m pretty new to the dairy-free alternatives, and have been looking at the cream cheesecake options. I notice you recommended the TJ’s cream cheese. I LOVE TJ’s but when I looked at it in stores, it seemed to have a lot more (and artificial) ingredients than Kite Hill brand. I am just more wary of that ingredient list versus other brands. Just hoping to get your thoughts on this! Thanks!! Tried this and loved it. Used a store bought parm that wasn’t great, so I’ll make my own next time. I loved this recipe!!! I used cashews instead of the vegan cream cheese and subbed brussels sprouts for the asparagus. It was so yummy! Probably one of my favorite vegan recipes. It was very good. My son ate two plates of those pasta and it doesn’t happen very often.. I just made this for lunch. DELICIOUS!!! This dish was amazing! Next time I’ll add more asparagus and mushrooms, but it was according to my husband, the best vegan dish I’ve made yet! Thank you! Oh and by the way…the Vegan Parmesan cheese is to die for! I have a hard time finding raw nuts and if using roasted and salted cashews…no salt is needed! Yum! I just enjoyed this dish. Congrats, it was amazing!! Keep going! I made this last night using Neufchâtel instead of vegan cream cheese and left out the nutritional yeast, and wow!!! My family and I ADORED this recipe. We served it with brioche to soak up the delicious sauce and enjoyed an amazing dinner. My boyfriend loved this! We used red lentil pasta to make it gluten free. I also used store bought vegan parmesan. It turned out great! My boyfriend and I made this last night and it was absolutely delicious – we loved the sauce! I did get a little confused though during the directions, at step 4, I didn’t realize I needed another skillet just for the cooked garlic before I put it into the food processor for the sauce. The way it is written makes it sound like I am using the same skillet the mushrooms and asparagus are still in. Otherwise, my only other issue was finding nutritional yeast – which there is none in stores where I live. We substituted it with a little bit more cheese and also a handful of raw cashews. Great recipe over all! Definitely will make again. Delicious! Loved this dish and it was easy to make too! Just had the leftovers for lunch today – delicious with a drop of additional almond milk and topped with more of Dana’s vegan parmesan cheese! I did it with the soaked cashews (1 hour in hot water), adding a bit of veg broth to make it more liquid, used double the asparagus (kids are not mushroom fans) and some French tarragon (tarragon is amazing with asparagus! ), and it was super delicious! Thanks Dana! Love the cookbook too! Disclaimer – I subbed out the milk and used coconut milk (husband and I both have almond allergy) and I did use dairy cream cheese and parmesan cheese again due to allergy issues, I’m only about 95% vegan and hubby wouldn’t claim to be even 50% vegan, but he eats what I cook for the most part. My son used to love asparagus but has been on a kick lately of refusing to eat it, and my husband HATES mushrooms – I did chop the mushrooms up a bit smaller than pictures to help them blend in, but both my husband and son (3-years-old) went back for seconds tonight! I’ve really missed my completely authentic (but has WHOLE stick of butter in it) alfredo sauce recipe I got from a friend who was a chef in Italy; this was close and completely took care of that craving!!! Thanks for another great recipe! I doubled the recipe, so I can have extra left overs for work for the next few days. I will say that when tasting the sauce on it’s own it seemed a tad bland, even after adding the extras to adjust. It was balanced, just bland. So I decided to just go for it and add the noodles and veggies. After they were combined, it was perfect. I’m so glad I didn’t alter it, the cheesiness just peeks through enough, but doesn’t over power the veggies. This one is getting written down and put in my “favorite recipes” box. I’ve made this recipe twice- once using vegan cream cheese and the other time using soaked cashews; it was great both times! A little less “cheesy” without the vegan cream cheese but I added extra lemon juice, raw garlic, and almond milk to make up for it. My girlfriend and housemates love it! This turned out very well! I ate it with your garlicky kale and chickpea salad, I think they went very well together. It was also surprisingly quick to make. I just want to say that I love your website and cookbook. I have two little boys who are both adventurous eaters but time is always an important factor. I made this recipe (doubled) for 6 adults and 6 toddlers, none of them vegan and none of them the wiser. We loved it! Thanks again! just stumbled onto your blog and i’m OBSESSED. fully plan to fill a pinterest board with all these delicious-looking recipes! for this pasta, any suggestions for a mushroom sub? husband haaates them and there’s no hiding them in this dish (the way i do in others). So kind! I would suggest doubling the asparagus and leaving them out! Scallion also makes a nice substitution. I went totally off script and made a “dirty” version of this — used whole milk and Philadelphia cream cheese (half as much as the recipe calls for). Did not use nutritional yeast. And as I always do, used about 5X the recommended spice. Oh, and I had no pasta so I used rice, and the only mushrooms I had which were Chinese dried Shitakes. I’m happy to report it was delicious. Wonderful. Added onions+red bell pepper, and spread a bit of daiya cheeze on top, and I’m in love with this recipe!!! I also did x2.5 with the yeast and I’m glad I did. This was so easy to bring together and the sauce is DELICIOUS! I’m a sucker for creamy sauces, but haven’t been a fan of any of the cashew based ones that I’ve made. The cream cheese in this sauce is perfect and the veggies are a great addition. Love this! Creamy and delicious! The vegan cream cheese is an amazing idea! adding veggies is a good idea too (I love green beans in anything). This is so yummy it is picky- vegan- cheese- snob- boyfriend and non- vegan- total- carnivore- roommate approved!!! I made this and it was loved by everyone! Absolutely delicious! I just started following you today. WHERE HAS THIS BLOG BEEN ALL MY LIFE! I love it!!!! Amazing! This was a huge hit with my family. Loved it! Will definitely make again. Just made this tonight and it is delish! My 6 yr old liked the pasta but I may try it with broccoli next time. I love garlic but may also try with a tad less next time. I may also try to find another brand of vegan cream cheese. My local store only had the daiya brand and while still creamy, it had a slightly strange smell (but my first time using vegan cream cheese so maybe they’re all like that?). Very good overall! I find the daiya does have a bit of an odd smell to it, and texture in some of their products. I think it must be bc it is made out of plant protein? Maybe? It sounds like some of the other brands are made out of almonds or other nuts? My son loves all of the daiya products! But I am still on the fence – I do like their yogurt tho! I am not vegan so I don’t have much to compare this brand to – my son is due to allergies. 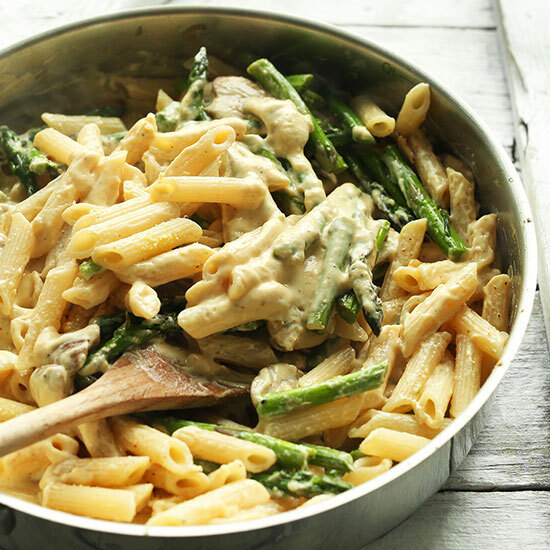 Mushrooms, asparagus and a creamy pasta. That sounds amazing. I think I’ll also struggle to find vegan cheese so I’m tempted to try it with proper cheese. Mmmmm. Dana! I admire your skills! I´m personally starting to cook different stuff in order to improve my lack of quality haha…which blogs do you follow besides yours? I´ve been personally trying to cook Barilla´s recipes that they share in their website. Very easy for beginners like me, and different options as well! Have you tried those? This recipe is a winner. Husband and I devoured it. The sauce was bold, creamy, the right kind of tangy, and indulgent. I LOVE THIS PASTA!! It was really fun to make as well! I loved this as written. Super-tasty! My kids weren’t so excited about the asparagus. I think next time I would make half with broccoli for the kids and half with asparagus for adults. This was delicious! Even my 2 & 4 year olds cleaned their plates! We’ll definitely add this to our rotation. Thanks for the great recipe! Made this last night for dinners and lunches for the rest this week and it was so good! Made it as written. It was super garlicky, but that is probably because my garlic cloves were massive. I didn’t mind, but my husband did, so I might have to be more light-handed in the future. I had never used vegan cream cheese before; I loved how creamy the sauce came out. Definitely making this one again. I’ll be trying this out tonight. Looks Ah-mahzing. Just wondering what the nutritional yeast is included for. Flavoring? I’ve got some on hand for helping with milk supply, I’ve just never seen it in a recipe before so that’s cool. Yes! It adds that “cheesiness” to the dish. Good luck! This turned out wonderful. It came together really quick and !10 cloves of garlic! I thought ‘this is insanity’ as I was making it but it was perfect. We are a raw dairy family so we substited those ingreds. My 3 yr old finished her plate even the asparagus. Beautiful and delicious recipe. My thanks to you! We will be doing this one again. Fantastic pasta dish. This may be my all-time favourite. The sauce is so creamy. The vegan cream cheese isn’t available everywhere, so when I found it I bought two. I made the cheese cake that you posted earlier this month and now the pasta sauce. Asparagus is still not in season in Canada so I used broccoli instead. Wonderful! Just finished dinner… totally! absolutely! wonderfully! delighted! Had no asparagus or crimini mushrooms so used broccoli and white. Had no penne so used spaghetti. Used Tofutti’s herb and chive cream cheese that I found at our local 7th Day Adventist market. It rocked! Because I live in Australia, many of the products mentioned are not available. However for Australian readers I recommend San Remo GF pasta. Their pene is very good. Make sure you actually get the gf one, because if you are like me and you eat the wrong one, you will become very, very ill. Its available in most grocery stores. Equivalents for other products e.g. vegan cream cheese I am still trying to find. I live in Sydney and I bought tofutti cream cheese at woolies. I have found it at different locations so you should be able to pick it up at one of your local one’s. I did find the finished dish a bit of a weird tang but I didn’t mind it. My boyfriend wasn’t a fan though. Tried this recipe tonight and loved it!! Used soaked cashews instead of cream cheese and it was delicious. Sautéed the vegetables a tad longer and added more garlic and Carmelized onions, it was amazing! Thank you so much for the recipe. I give it five stars! How long would you recommend soaking the cashews (instead of using vegan cream cheese)? Thanks! 1 hour in very hot water! I would love to try this yummy-looking recipe, but my youngest daughter is allergic to cashew. Any idea on how to make a nut-free vegan parmesan cheese? My daughter is allergic to cashews as well. I found a soy/coconut based vegan Parmesan : Go Veggie cheesy bliss by Galaxy Nutritional Foods. Hope you can find it! (White cap with green see through label). I make a vegan Parmesan using equal measures of hemp hearts and nutritional yeast, with a pinch of salt. Very yummy! I’m so glad that I subscribe to so many blogs otherwise asparagus season would have gone right over my head! It seriously just makes my day to see this unbelievably creamy, smooth, velvety sauce and know no animals were harmed making it :) I replaced vegan cream cheese with cashew nuts in a lot of recipes and it works just as well, super creamy, just make sure you blend long enough and that there are no pieces of nuts in the sauce anymore. Thanks for sharing his recipe! I’m always all about the carbs especially when smothered in creamy cheesiness! 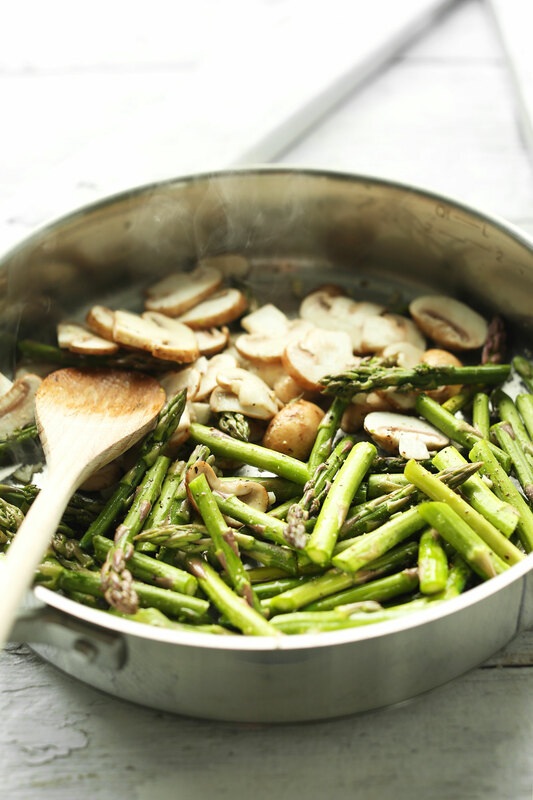 Mushrooms and Asparagus- my two favorites! It looks delicious! If you are near a Whole Foods the brand Kitehill makes delicious vegan cheeses including cream cheese that are all almond based. My fav! Kite Hill is by far the best vegan cream cheese! I used kite hill as well. Turned out great! I will be making this again next week when we have company. Kite Hill almond cream cheese is what I used too and it was delicious! I was also going to put in my vote for Kitehill. Blows everything else out of the water, in my opinion, and with very simple ingredients! Looking forward to trying this. oh my goodness – looks beautiful! Pasta is on my menu for tonights meal! Have to try the mushroom, asparagus combo! I was totally feeling the combination of asparagus and mushrooms for tonight, and then I saw this! We’ll be eating something else instead but will have to keep this recipe in mind! Honestly, how did you make this look so creamy without any “real” dairy? We love the asparagus in here, although my wife says I’m very immature when I eat asparagus and I stick it out my front teeth and flap it around asking any and all if there’s anything stuck in my teeth. I love your blog but I feel like the recipes are becoming less “minimalist”. Ingredients like vegan cream cheese are very hard to find and are also really expensive. Would love to see more recipes with simple, easy to find ingredients. I knew people might have trouble/issue with using vegan cream cheese, which is why I included an alternative in the notes! See that for some guidance. I was half way thru cooking everything and realized I forgot to get Vegan Cream Cheese at the store. I am new to vegan cooking so it was a little scary to improvise, but it was a success! I found that creating a roux out of vegan butter and flour, then thinning it with almond milk, and adding the other ingredients directly to the pan worked very well. Unfortunately I never measure out ingredients for my roux, but I would say I used about 2.5-3T of vegan butter, cooked that, added 1/4C flour, cooked that, and then added the almond milk. At this point I added about 1/4C of coconut cream for added creamy-ness. After that I followed the recipe (adding a bit more nutritional yeast and some garlic powder) but rather than using the blender, like I said earlier, I added everything directly to the pan.